Jennifer Byrne as Sleeping Beauty, Jordan Aragon as Jack, Hannah Record as Cinderella, Courtney Capek as Pinocchio, and Aléna Watters as Snow White. Photo courtesy of Tuacahn. “Fairy Tale Christmas” is, perhaps, one of the most creative productions to ever grace a Southern Utah stage. That’s saying a lot for a region that is home to both Tuacahn Center for the Arts and the Utah Shakespeare Festival. It’s even more impressive because Tuacahn’s current production of “Fairy Tale Christmas” is a world premiere. It’s a story about heroes and villains, many of whom will be familiar to children and adults alike. But because it’s Christmastime, those legendary fairytale characters will be transported to the North Pole, where they interact with Santa Claus, of course. DeMone as Santa. Photo courtesy of Tuacahn. We first meet the fairytale villains as they begin to hatch a plan to hijack Christmas and destroy the concept of “happily ever after.” Thankfully, Santa has some heroic friends like Cinderella, Snow White and Pinocchio to help him out. There probably aren’t enough positive adjectives out there to fully encapsulate “Fairy Tale Christmas.” It’s fun and captivating and sweet. It even has surprising depth, offering moments that can be quite moving. While it takes place in the North Pole, the production inside Tuacahn High School’s indoor Hafen Theatre is quite cozy. This isn’t a high school production, though. All seven actors are Equity professionals and it shows. There’s even a live orchestra that is so good, it sounds as if the actors are singing along to studio tracks. Even though the first number, “South Side Outside,” was slightly noisy on Tuesday (perhaps the sound balance was off at first? ), it’s still a dynamic and catchy opener — benefitting, like every other musical number, from director/choreographer Jeffry Denman’s brilliant machinations. The actors’ timing, blocking and dancing was practically flawless, showing Denman’s skills in bringing it all together. Hannah Record as Singing Elf, Aléna Watters as Singing Elf, and Jennifer Byrne as Singing Elf. Photo courtesy of Tuacahn. By the time three of the villains turn into elves before your eyes, the show will have won you over. Not only do the villains play elves; they also play the heroes. With only seven actors in the production, each of them play a number of roles. The creativity behind this is part of the fun. Their outstanding costumes, by Dustin Cross, are designed in such a way that they quickly transform between hero and villain — essentially putting twice the number of characters on stage than actual actors. Songs like “Sweet Revenge” are instant classics, full of both hooks and humor. Meanwhile, story elements like skunk jerky and characters like Telegram Stan or Larry Pinecone give the musical a quirky vibe and potential to become a cult classic. However, this musical deserves much more than cult classic status. It’s more entertaining in its short 1.5-hour run time (with no intermission) than most Broadway-level musicals. It’s really something of a Christmas miracle. The acting and singing is top-notch. There’s not a weak link among them. It’s not even possible to pull out one or two standout roles because they are all so equally good. Jordan Aragon convincingly portrays a sympathetic anti-hero in Rumplestiltskin while also becoming a break-dancing Jack (of “Beanstalk” fame). Matt Ban plays the engagingly gruff Giant (also of said “Beanstalk” fame) while also getting his loveably over-the-top Gepetto on. But that’s not all, he’s also the elf Larry Pinecone and, impressively, a variety of princely characters. It’s even difficult to decide which of Ban’s six or seven characters is the best. Jennifer Byrne gives us Agatha, the wicked stepmother, with her fantastically exaggerated choreography and diction while also playing the narcoleptic Sleeping Beauty and a singing elf. Jordan Aragon as Kevin Snickerdoodle and Courtney Capek as Imogene. Photo courtesy of Tuacahn. Courtney Capek is the heart of the play, giving us the sweet elf Imogene and the equally sweet little Pinocchio, while also portraying Belle and another singing elf. Hannah Record plays a stereotypical evil monarch as Drama Queen. Additionally, she’s another singing elf and Cinderella, who appears to be the leader of the hero characters. Yet it’s her short stint as Telegram Stan that will have the tears of laughter rolling down your face. Finally, Aléna Watters gives us the Maleficent-like Medoza and Snow White, while also proving to be the most memorable of the singing elves, thanks to a hilarious, cartoonish accent. Technically, it’s a brilliant production as well. Brad Shelton did his normally excellent work on the set design, but it’s enhanced by an inventive use of video projection to change sets within milliseconds. Even better are the enchanting flying scenes in Santa’s sleigh. This is next-level technical theater. Whether you’re singing along with Santa on “Dream Sleigh” (“It’s powered by reindeer poo”) or breakin’ it down with DJ Crownz (Prince Charming’s side job, apparently), “Fairy Tale Christmas” is a whole lot of fun. It’s not all entertainment though. Part of the storyline rests on Santa’s decision to give presents to all the children of the world, not just the “good kids,” because every child has goodness. And, ultimately, it’s not a story about heroes and villains; it’s a story about people — people who are complicated and nuanced and, yes, maybe even deserving of a little redemption. All of this comes together to create a clever theatrical production that is just as magical as it is joyful. It’s too bad the Christmas theme will likely relegate a “Fairy Tale Christmas” to a certain time of year because it’s a story for all seasons. “Fairy Tale Christmas” continues every Monday through Saturday until Dec. 30 (with the exception of Dec. 25 and 26) with showtimes at 7:30 p.m. each day and 4 p.m. matinees on Fridays and Saturdays. It is staged in the indoor Hafen Theatre at Tuacahn High School, 1100 Tuacahn Drive, Ivins. Tickets are $29-$39. 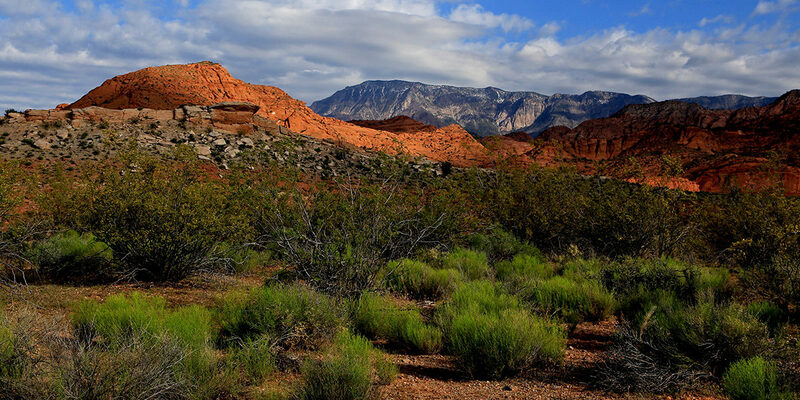 Visit Tuacahn.org or call 800-746-9882. Hannah Record as Drama Queen, Matt Ban as Giant, Aléna Watters as Medoza, and Jennifer Byrne as Agatha. Photo courtesy of Tuacahn.